Students say “I understand what you did, but how did you know it would work? I would never be able to come up with that.” This is a big problem with the way we teach maths, especially at the more advanced level. We want students to develop into resilient problem solvers who learn from their mistakes, but most of the time all they see modelled from their teachers is carefully crafted examples, pruned and polished until they are as efficient and sanitized as we can make them, with no hint of the rough-n-ready manner in which they were born. When’s the last time you stood up in front of a class of students and tried to tackle a problem that you didn’t already know how to solve? Not just through inadequate subject knowledge or bad planning, but in a deliberate attempt to model failure and how to deal with it for our students. They already know what success looks like, and half the time we make it look so effortless they get even more demoralised when their own experience doesn’t match up. Don’t they deserve to watch us flounder, sweat, get stuck and be confused once in a while, too? Even if we occasionally take a punt at an unfamiliar question in class, I’m guessing for most topics we can see how the problem will play out before we start (or at the very least, its general trajectory), which doesn’t quite fit the bill. To get well and truly stuck, you either have to be testing the boundary conditions of your subject knowledge comfort zone (Further Maths A-level has a few areas like this for me, still), or tackle something like a UKMT maths challenge problem, or something from the excellent Integral Maths Ritangle competition. Solving a maths problem to me feels like the film Groundhog Day. The first time you tackle it, it’s a mess. You may not get the solution at all, or even close to it. Perhaps when you come back to it, having reflected on the dead-ends and false trails, you can do better. Define your variables, because that tripped you up last time. Clarify your assumptions, and tidy up your notation because those simultaneous equations get messy fast. A couple more attempts, though, and you can solve it in your sleep. You even spot shortcuts that would never have occurred to you the first time around. And when you miraculously pull the perfect substitution out of your hat the next day in class, and they whisper “It worked! But how did he know to do that? ?” it’ll look like magic when really it was good old-fashioned hind-sight. A colleague shared a geometrical problem with me that he said could be done in your head “after you know the answer”. Which makes perfect sense to mathematicians: solving a problem doesn’t just give you a solution, but an insight into the entire scenario. When I’m feeling especially reckless, I bring my selected unsolved questions into the classroom. Narrating my thought processes, and letting the whiteboard fill up in the half-structured half-chaotic manner that back-of-the-envelope problems do, I can show students what it looks like for me to struggle with an unfamiliar problem. They see the wild goose chases, the uncertainty, the dubious assumptions and second-guessing. They see me get stuck, and take stock of what I’ve tried and how it helped, if at all. They see me back-track, and start again from scratch, and get it wrong, and hunt for that dropped minus sign, and look for ways to verify my solution. And with any luck, in the post-mortem, we’ll spot that elusive, elegant pathway through the maze which is often only visible from the end. My plan with the multiplication table was to give learners a clearer intuition for multiplication. It is my firm belief that most difficulties students encounter with ‘hard’ topics like proportion, fractions and algebra usually stem from an inadequate grasp of, and familiarity with, multiplication. There’s no point trying to teach expanding brackets until the distributive property makes sense numerically, for example, and the right sort of visual might help students to see not just the what, but the why. I believe we develop our understanding of mathematical concepts in two main ways: making connections, and building familiarity. New ideas are never wholly new – they build on previous ideas, or take one aspect of something we know and develop it somehow. But until we spend time messing around with them, our understanding will only remain skin-deep. Making connections – linking the new idea to prior understanding – will involve well-chosen language, examples and analogies on the part of the teacher. However incomplete or flawed these are, if chosen carefully so as not to actively hinder future development of ideas, they can form a vital (if temporary) bridge to otherwise inaccessible concepts. I have found the ADEPT method outlined on www.betterexplained.com to be incredibly helpful in developing and adapting my own explanations of tricky concepts to students. Building familiarity – playing around with mathematical ideas – should involve both problem solving and open investigation . Because of the time-consuming nature of play, and the fact that we can’t know in advance what the ‘learning outcomes’ may be, this method of teaching often takes a back seat in the maths classroom. Fortunately this is not the case everywhere. http://www.inquirymaths.co.uk/ champions the practice of providing students with a well-chosen prompt and giving them the freedom to explore the ideas that arise. Bringing together both of these aspects – making connections and building familiarity – the rich tasks provided on www.undergroundmathematics.org are designed to emphasize the links between A-level topics and also encourage more open investigation than is found in the typical textbook or exam question. The hard part is providing sufficient direction for students to access the problem, but leave enough room for the creative investigative problem solving that maths is really all about. I recently used a couple of tasks from Underground Maths in a plenary lesson on functions for a year 12 class. By this point in the year, students have worked with functions and graphs in the context of straight lines, circles, trigonometry, polynomials and calculus, and even statistical distributions or kinematic graphs, and a solid grasp of functions will underpin much of the upcoming year’s content, from parametric curves to circular motion, so I wanted to make sure students weren’t just memorizing the rules for translations and stretches, but developing a sense for functions that goes a bit deeper. This activity encourages students to consider how transformations affect gradient. It provides sufficient direction to be accessible while keeping the questions broad enough to promote discussion – there’s no one correct approach, and working in a group gave them the freedom to discuss possible methods and gain alternative perspectives. One student used differentiation to investigate the effect of stretches and translations on cubic functions, and was then able to make the next step, differentiating to , proving the same results for a much more general case. We also had discussion about how the same sort of process governs transformations of data (specifically why standard deviation is invariant under translation). The second part of this activity turned out to be a great way for students to grapple with what changes and what stays the same when functions are transformed. In particular, the fact that functions were only described in terms of a general function meant students didn’t get bogged down in specifics, which can make it hard to keep a clear view of the problem, and could focus instead on how the input and output were affected by each transformation. This graph prompted a discussion about what it means to be a function, and provided a nice precursor to the whole area of parametric curves. Whether or not it fit the requirements of the question was no longer the issue – the original activity provided a vital prompt, but when it was no longer needed to direct students’ curiosity, it was simply put to one side. What’s the difference between an abacus, a calculator and a smartphone? What’s the difference between , and ? Some tools do one job, some many, and some have potential beyond what their designers ever imagined. Functions are to algebra what algebra is to number – they provide a wide angle lens that allows us to ‘see’ the algebraic structures and patterns which would be almost impossible otherwise. Now every student with a phone can use GeoGebra to investigate functions, I can’t wait to see the impact on understanding. Some people argue that logarithms are an outdated topic and have no place in our curriculum. They were useful back in the day, but smartphones have all but made calculators obsolete, let alone slide rules and log tables. What need have we for this confusingly different mathematics? The key idea underpinning logarithms is this: They are a way of counting multiplicatively. And there are, in fact, many good reasons for wanting to count in this way, rather than in the traditional additive sense. I asked my year 12 class how many Christmas trees were sold in the US each year. One guessed “300 million” and another guessed (I suspect facetiously) “3”. Given that the true number is around 30 million, which of these students was closer to the truth? And if you went with the 300 million guy (who overestimated by 270 million) rather than the guy with the ludicrous underestimate (29,999,997 too low) then presumably you are using a different scale to gauge accuracy than a straightforward additive one. Consciously or not, we usually prefer a logarithmic scale for such comparisons, especially when the values vary considerably in size. The first guess was 10 times too big, but the second guess was 10 million times too small. Without thinking too hard, where do you think the number 1,000 belongs on this number line? While not many people would have put it right in the middle, most people’s initial reaction is somewhat further along than an additive scale would place it. The true position is somewhere inside the blob above ‘1’ on an additive scale. But isn’t there some sense in which a million is ‘halfway’ from a thousand to a billion? Yes – a multiplicative sense. Dave gets a 20k pay rise. Is he much better off? It depends on what he was on before, doesn’t it? On the one hand, 20k is £20k, but £520k is only 4% bigger than £500k, while £24k is a 500% increase on £4k. In fact, whenever we invoke proportion, we are dealing with a logarithmic number sense. With this new form of number sense, we need new rules for moving along the number line, and that’s where thinking about numbers from the point of view of the exponent starts to really pay off. If you haven’t yet seen the superb ViHart video on logarithms, I highly recommend it. 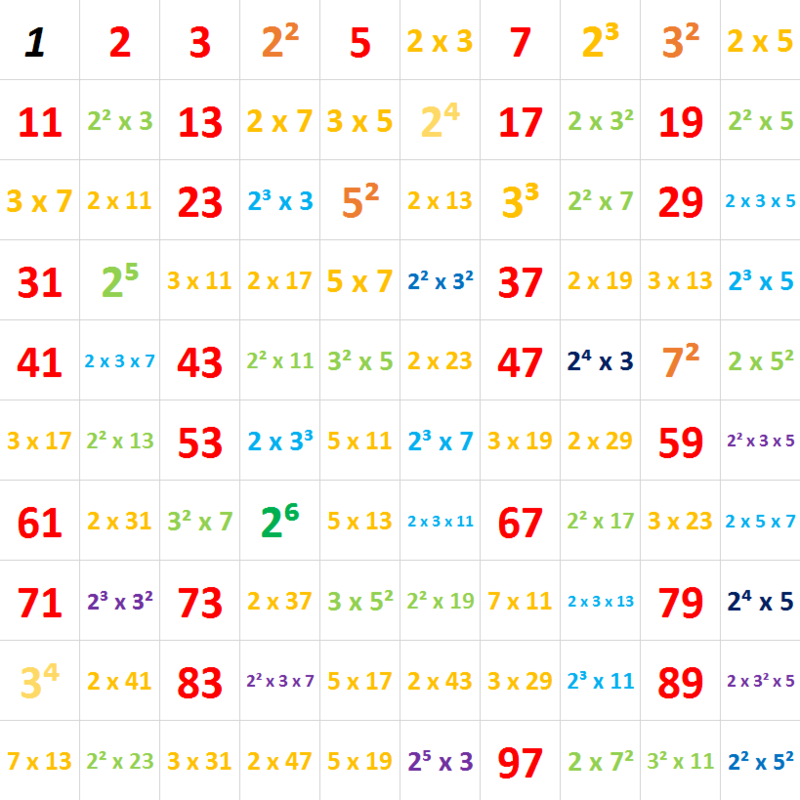 It makes sense of this multiplicative number scale beautifully. When you start to look around you, there is evidence of a multiplicative number sense everywhere. How can going down from 2 cigarettes to 1 be harder than from 20 to 19? In what universe is having a 6th kid less of a big deal than having a 2nd? How could a 10th friend joining a party less noteworthy than the 3rd one? Who drives 10 minutes to save £5 off a £15 item, but not a £150 one? Given that logarithms and this logarithmic number sense are such a natural part of how our brains interpret quantities, it makes perfect sense to try and find a rigorous mathematical way to represent and manipulate them. The ‘number of digits’ interpretation of logarithms is a particularly helpful one. While log10 isn’t exactly the same, if you round it up it gives you exactly that. A really helpful idea from the excellent new Underground Mathematics website involves working out just how far up an exponential graph will go: https://undergroundmathematics.org/exp-and-log/reach-for-the-stars. We need to grasp the fact that, as fast as exponential graphs increase, logarithms do the opposite, requiring us to travel literally miles along the horizontal axis just to reach a reasonable height on the y-axis (for the record, 500 miles along gives you about 1 handspan in height on a log10 graph). As usual, I’d welcome any feedback / ideas / corrections on the ideas & resources included. 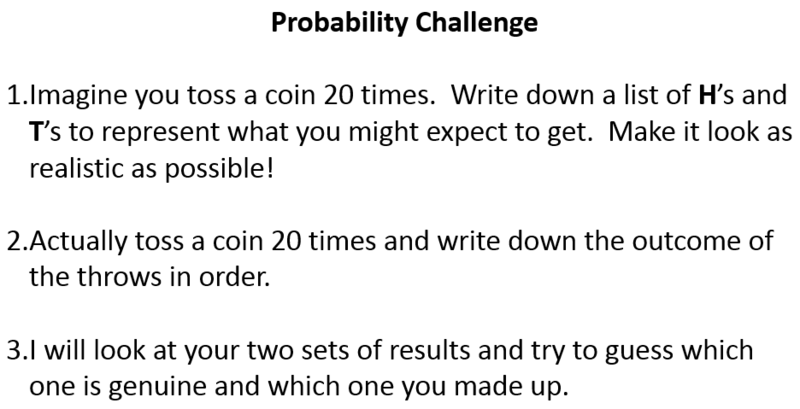 What are the chances of teaching a great probability lesson? In my experience a probability lesson runs smoothly about 50% of the time. Some days those pesky dice will throw sixes all afternoon, or some lucky sod will beat your thousand-to-one odds and win a fiver in the coin-toss challenge. But if you play your cards right (‘scuse the pun) these lessons can be fun for you and the students as well as a great way to challenge our in-built misconceptions about randomness and chance. Have you jotted down your fake list yet? (A string of 0s and 1s in Notepad will do). Now do the experiment for real (if you’re feeling lazy – or skint – use https://www.random.org/coins/?num=20&cur=60-gbp.1pound). Did you notice anything odd about the real coin tosses? The often surprising fact is that runs occur more frequently, and are longer, than we generally assume. This experiment works better with more coin tosses, but 20 is usually enough to see some discrepancy between an invented list and a genuine one. According to http://wizardofodds.com/image/ask-the-wizard/streaks.pdf, there is a more than 75% chance of a run of 4, and a 45% chance of a run of 5, though the actual maths involved is a bit beyond high school. Fortunately he includes a handy graph. The key idea is simple enough: a run of 5 means four coin tosses must show up the same as the previous one, which occurs with probability one in sixteen. Makes sense that you’d expect it to happen somewhere in your 20 coin tosses reasonably often. While the genuine results sometimes don’t have any striking streaks, it’s very rare for invented lists to have any more than 3 in a row before our built-in equalizer tells us we should really be balancing out the proportions. The other day I tried this with four teams for my plenary activity, and correctly identified the fake from each of the four teams. Coins, dice and roulette wheels are like Dory from Finding Nemo – getting a tail last time makes it neither more nor less likely to get one this time. We teachers know this, but are just as likely to fall into the trap of avoiding streaks as our students. This can be modified to reflect whatever probability distribution you choose. It’s worth pointing out that there are still ‘large’ gaps numerically between the most common and least common outcomes for bigger sample sizes, but they tend to become less significant as a proportion of the whole. I tried this recently with more success than I expected. Students completed the probability experiment for homework (recording the sum of two dice rolls a bunch of times), and I collated the class results in a spreadsheet. After my trick with the coin tosses they knew they wouldn’t get away with making up results, so their tables were genuine and yet not particularly close to expected values. For a sample of just 36 dice rolls each this is to be expected, but it was really interesting to show them that even their motley collection of not-too-good-looking results, when combined with each other, averaged out to resemble the theoretical distribution very closely. Again, the power of large samples coming into its own. On a similar theme, I tested a theory with my year 9 class last week on the power of collective guess-work. Having just shown them how uncannily predictable their combined probability homework results were (however unpredictable each individual result may have been), I told them how the average guess for, say, the weight of a pig or the number of sweets in a jar, has been shown to be better, often, than any one person’s prediction. 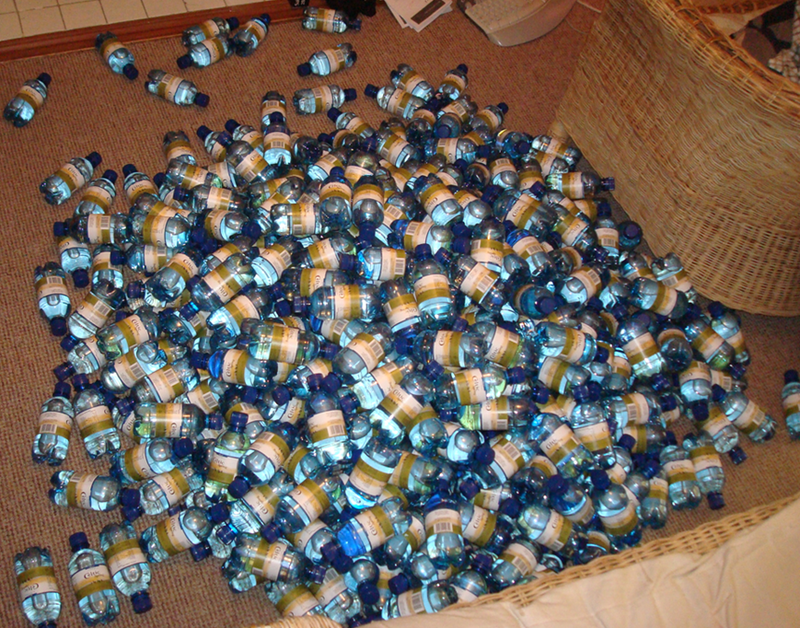 They clamoured for proof (in retrospect, possibly just for sweets), so I used a picture I generally reserve for trial and error lessons of a pile of bottles I once counted, and the class average guess for the number of bottles in the pile was within 1.7% of the real total! I was seriously impressed. Randomly generate American men: I’ve included links to a few Excel files I use for probability, but it can be really helpful to be able to throw something specific together on the spur of the moment. So here’s a few Excel formulae you may find useful: =RAND() is the obvious one. Gives a random number (rectangular distribution) between 0 and 1. May equal 0 but is always less than 1. Multiply by it to scale up the range, and add to move the range. So =5*RAND()+2 gives numbers greater than or equal to 2 but less than 7. You can even round, but =RANDBETWEEN(1,6) is a simpler way to generate random integers (from 1 to 6 inclusive). Here’s a clever one for the statistics boffins among you: =NORM.INV(RAND(),0,1) gives a random number normally distributed about the mean of 0 with standard deviation 1. It uses RAND() as a probability. Use it to create realistic sample sets like heights or weights. I have it on good authority that a normal distribution with mean 178cm and standard deviation 8cm describes the heights of American men. So =NORM.INV(RAND(),178,8) will randomly generate for you an American man. Well, his height, anyway. Nifty, no? For those of you teaching A-level Statistics, the next spreadsheet combines the statistical power of Excel with the actual values provided in the tables in the AQA formula book so you can find not only the correct answers but also the answers your students should be getting. Includes binomial and normal distributions. False Positive: Conditional probability is set to be a bigger part of the new GCSE, I understand. The counter-intuitive way that medical testing works makes this a really interesting example of conditional probability. The question you want to know is “Given that I tested positive, what’s the chance that I’m sick”, and it turns out the biggest factor in determining this probability is the proportion of people who get tested who are actually sick. Random Walks: My Snail Race activity was about as fast-paced and exciting as it sounds, but at least it gave me the chance to test out a nifty method for generating random numbers on the fly. Two competitors (who are not cooperating) hold up between 1 and 4 fingers simultaneously. Add the totals together, and use the remainder when divided by 4 to determine the direction to move next (left, up, right or down). This is a nice two-dimensional way to visualise randomness (and notice how often you double-back on yourself compared to how often you might have done if you were making it up). “I beat you, you beat him, he beats me. Wait… what?”: A probability ideas post would not be complete without at least a mention of the ingenious ‘Grime Dice’ developed by MathsGear and available here: http://mathsgear.co.uk/products/non-transitive-grime-dice . They are non-transitive, so if you memorize the order correctly this is yet another way you can reliably beat your class at an apparently fair game. Unless you memorize the order backwards, like I did. That’s a great way to reliably lose. Not only did nobody think of the six of diamonds, but only two people in the whole class even had diamonds as their chosen suit. My posters must have been sub-subliminal. Sticking with the null hypothesis on this one for the time being, I reckon. Each number forms a unique pattern. What determines the complexity and nature of the pattern? Can you deduce the rules? Some numbers refuse to be broken down nicely into groups. They resist the urge to be separated beyond the trivial groupings of ‘all together’ or ‘all apart’. 11 sweets won’t share nicely between any group except a group of 11 or a group of 1. Most normal people might note the anomaly, perhaps try to buy 12 sweets the next time and think no more about it. Meanwhile mathematicians, in our insatiable desire to look for patterns and rules, try – and, for the most part, gloriously fail – to find an elegant explanation for the distribution of these so-called prime numbers. Can you see the connection between numbers with the same colour coding? The study of prime numbers, and number theory in general, is one of the most abstract areas of mathematics. Until recently, with some clever computer scientists using their very intractability to develop encryption algorithms, there was no real application anywhere in science or technology. Which makes the topic either pointless or the purest of mathematics depending on your perspective. Number of factors from prime decomposition: By following a straightforward branching method, any number can be separated into its unique product of primes. From here, it is worth recognising that every factor is simply a combination, or subset, of those primes. 24 is 2 x 2 x 2 x 3, so its factors can have anything from no 2s up to all 3, and either no 3s or one 3. We can actually count the factors directly from the prime decomposition. How many 2s? (0, 1, 2 or 3) and how many 3s? (0 or 1) means 4 options followed by 2 options, giving 8 possible combinations (from no 2s and no 3s: 1, up to three 2s and one 3: 24). While primes themselves may hide their structure fiendishly well, by following this rule we can find patterns involving the number of factors for different types of number. Any number which is a power of a single prime will have one greater factors than the power (so 2 to the 6 has 7 factors). Powers of a number composed of two primes (such as 10) will have a square number of factors (10 has 4, 100 has 9, 1000 has 16, etc). Some numbers are special to us because of our number system (base 10). Count up the number of 2s and 5s in the prime factorisation of your number, and the smaller of the two numbers will give you the number of zeroes at the end of your number. Lastly, if you want an alternative explanation to why square numbers are the only ones with an odd number of factors, use the ‘product of one more than each power’ way of counting factors to see that this will only be odd if every power is even. How does the number of factors link to the prime decomposition? Linking the prime decomposition with whether a decimal expansion terminates or recurs. The terminating decimals have denominators which contain no primes other than 2 or 5. Why? Base 10, of course. In base 12 we would get terminating decimals from numbers built from 2s and 3s (so a half, a third, a quarter and a sixth would be 0.6, 0.4, 0.3 and 0.2, although a fifth would now be 0.24972497… – that one took me some time!). Try this with binary and numbers that would be fine in decimal, like 0.2, become recurring (leading to floating point rounding errors, in case you’re curious how computers can sometimes get 0.1+0.2 wrong). How the largest known prime ends, and how we know. 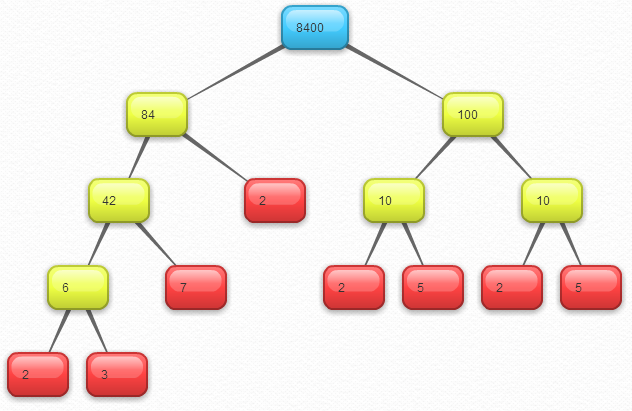 Enter any natural number up to 100,000 for its prime factor decomposition and its position relative to nearby primes. Primes can only ever be one group, but composite numbers break down in all sorts of cool ways. So you want to be an A-level Mathematician? Mathematics is a wonderful, terrible, elegant, messy, exciting and tedious subject. Students considering an A-level (or two) in this subject may rightly be daunted by the work-load, and intimidated by the huge stack of new ideas they are expected to assimilate and regurgitate two years later, but should take care not to get stuck in the rut of ‘what I need to be able to do for the exam’. Many courses come with a recommended reading list – a mesmerizing heap of relevant literature which, if not exactly essential to your course, will broaden your horizons and develop you further than the course textbooks alone would do. When a student starts A-level Maths or Further Maths, their ‘suggested purchases’ list consists of a £50 calculator and… um. Yeah, that ought to do. Inspiring, no? Veritasium: This YouTube channel mainly investigates physical phenomena, and yields surprising insights by means of identifying misconceptions. Essentially, the host will ask a bunch of people a question, identify the common misconceptions that we have about something, and then explain (or get an expert or two to explain, if it’s really tricky) what’s actually going on, such as this one about how we perceive temperature. Some videos are designed to have more of an interactive feel, where an experiment is carried out, and the audience (us) are given the chance to predict the outcome. One that will come in handy for getting to grips with the mass vs weight confusion is Misconceptions about falling objects. But a personal favourite of mine hits a very common area of confusion – is there really no gravity on the International Space Station? Brilliant: After getting a little distracted by all the cool science bits, let’s get back to a bit of maths. I’ve only recently discovered this website, but I’ve been really impressed. It’s essentially a bank of multiple choice maths questions, ranging from pre-GCSE to post-A-level, separated into categories and difficulty levels. Because of the format, it lends itself really well to smart phones, so download the app and fill those spare minutes brushing up on anything from geometry to calculus. Also includes sections on some of the more mathsy bits of science. WolframAlpha: An incredibly useful tool for all sorts of calculations. It works rather like Google’s built-in calculator (which, by the way, can draw graphs for you and all sorts), but is connected to Wolfram’s powerful ‘knowledge engine’, allowing you to integrate functions directly (not just get numerical approximations), work out your binomial expansions, solve equations and much much more. GeoGebra: This free program has revolutionized the way I teach certain concepts. It is easy to learn and intuitive to use, and has sufficient built-in capacity to develop all sorts of interesting demonstrations. Students can download it for free, use an online version or download an app for their tablet. They can use it as a graphical calculator, drawing graphs (including implicit functions and parametric curves), performing differentiation and integration, investigating shapes, learning matrix transformations, understanding projectile motion, and all sorts of cool stuff. I’ve made my own short introduction to the program, designed for students to quickly get to grips with the basics. By searching the uploaded files of other educators on GeoGebraTube, you can build an intuitive understanding of all sorts of hard-to-grasp concepts, as well as have your eyes opened to all sorts of new and interesting mathematics. Finally, a quick mention of my own website, TheChalkface.net. It doesn’t quite belong with the links above, but I do upload my teaching and learning materials, and the A-level Maths section is particularly good (in my opinion) for revision resources. It has links to AQA exam papers (downloadable in bulk instead of one by one), hundreds of worked exam solutions, my Not-Formula Book revision booklets and their further condensed Essentials revision cards, as well as a host of worksheets and activities designed to fit within the A-level syllabus. The links I’ve listed above are just the beginning – loads of people are doing fantastic work out there inspiring students (and teachers!) If there are any sites you think should have been on my list, please put them in the comments below – thank you!